Modern demographics of potential clients whether B2B or B2C are bombarded by a lot of passive and sometimes intrusive marketing initiatives. This environment makes it difficult to reach your target audience and keep their attention long enough to show why your product is of value to them. Thus, the popularity of providing web-based interactive content calculators is on the cusp of soaring. ROI calculators limit the risk individuals might be taking on a new product by answering their specific needs through an immediate interface and with clear numbers. This builds engagement and trust with your brand, while gathering the information that’s most valuable to your prospects in their motivation to purchase. Once you garner knowledge like their email address, your company can proceed with personalized marketing to these individuals, leading to a shorter sales cycle and more customers. Instead of spending 50K for 6 months of coding to create an unchangeable ROI tool, SpreadsheetWEB can offer you a better and more cost-effective solution using Excel as the platform to build and maintain your ROI calculators. There’s no one-size-fits-all for customers just as there isn’t one for businesses. SpreadsheetWEB allows your business to have full control over designing and improving your calculators combining the accessibility of Excel and our service for translating excel worksheets into secure, database driven web applications. This gives you maximum flexibility at a relatively low cost. In addition to using our services to implement your ROI tool, you can create customized reports that are delivered via email, capture and store valuable customer information, and send automated response and feedback results relating to your ROI tool. Take the example of an electrical services company selling and installing LED fixtures. 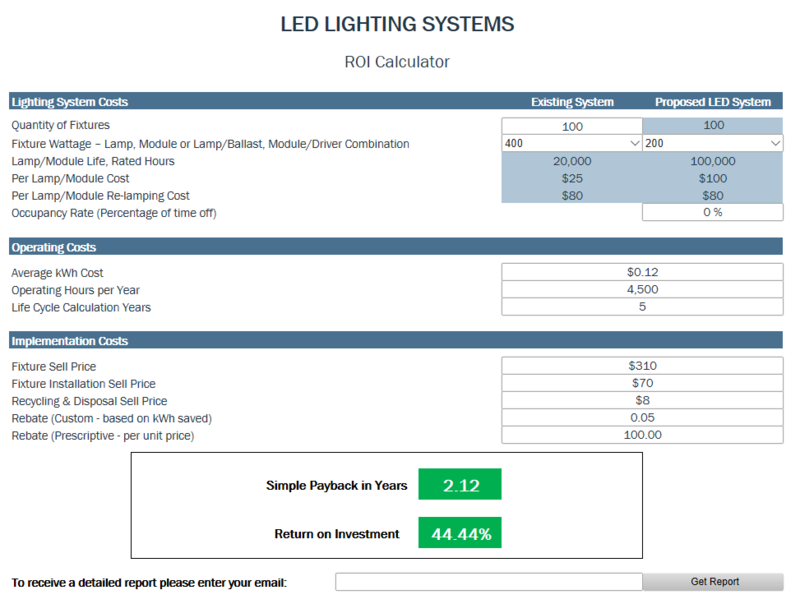 They have built an ROI calculator in Excel to demonstrate savings by switching from traditional lighting fixtures to LED based ones. By simply entering a few data entries, you can see total cost of the project and how fast it pays off the investment through cost savings of electricity. 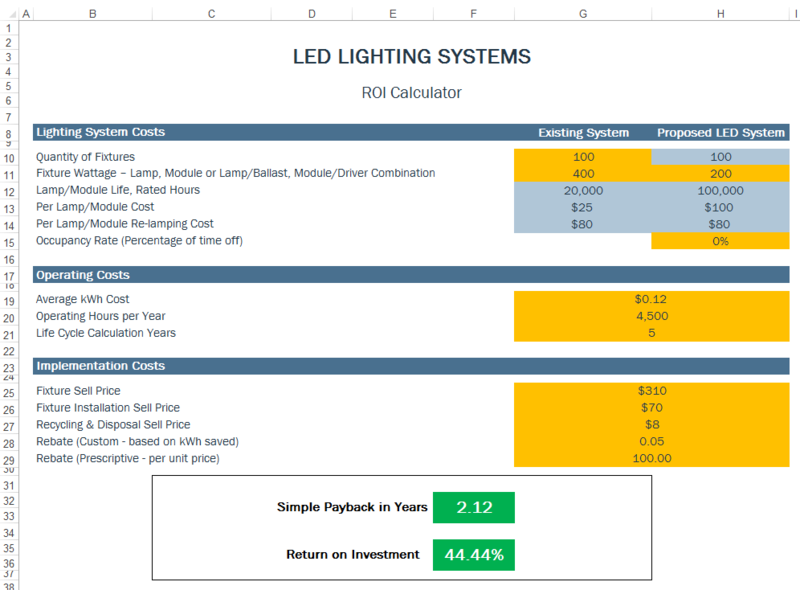 This is a screenshot of the ROI calculator build in Excel. A user can see the return on investment and payback time by filling out a few data fields in the application and then choose to receive a detailed report after entering their email address. The electrical services company then has the prospect’s contact information and details of the project. This information will increase a sales person’s chances of closing the deal by offering specific solutions based on the prospect’s needs. Instead of relying solely on the persuasive abilities of your team, you can complement them with interactive content that backs up your message with numbers. When you offer a calculator to your audience, you not only supply leads with an immediate service and personalized attention, you capture a set of specific information about their current circumstances. Securing this kind of data in a non-obtrusive and nearly autonomous way can revolutionize your marketing plan. SpreadsheetWEB wants to help you finetune your strategy by offering you a low cost and easy to maintain solution for creating your own interactive ROI calculator.